Savoiardi are an elegant, long, sugar-crusted sponge cookie often served as an accompaniment to gelato, espresso or pudding, and used as an ingredient in tiramisu. They are also used as teething biscuits for budding gourmets. Savoiardi originated in the Piedmonte, which was once a part of Savoy„hence the name. 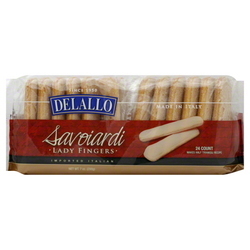 Our Savoiardi are made in Italy by artisans who have mastered this crisp, airy treat.